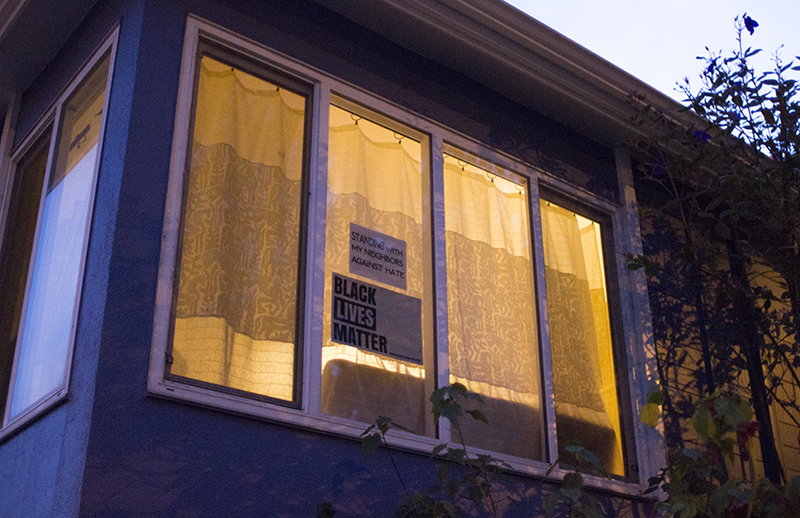 Covering the Police is an effort to look more closely at how police work in the Mission and elsewhere in the city. It is a collaboration with U.C. Berkeley’s Graduate School of Journalism. The Monday after a car drove into a crowd of protestors in Charlottesville, a hate letter was delivered to the home of San Francisco resident, Debbie Lee — and then another. 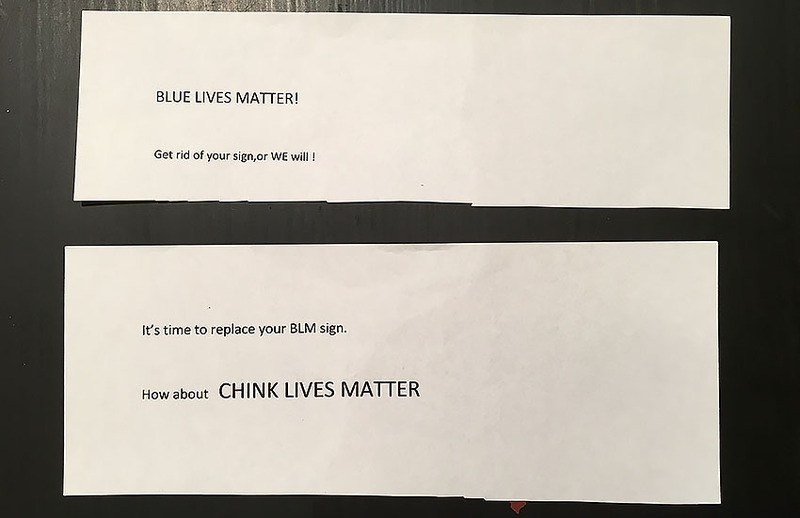 “It’s time to replace your BLM sign, how about Chink Lives Matter,” read the second message sent to the Tamayo-Lee family. On Monday night, those blue lives and Supervisor Norman Yee recognized the Tamayo-Lee family with a “Certificate of Honor” at the Park Station police district’s community meeting. “The citizens of SF and the Board of Supervisors extend this accommodation to the Tamayo-Lee family for inspiring others to carry the message of inclusiveness and community empowerment,” Yee said during the ceremony. 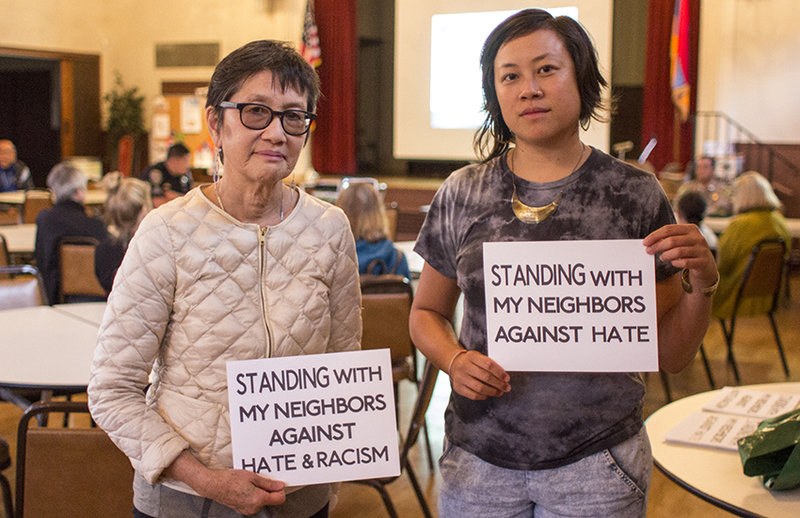 Initially, the Tamayo-Lees chose not to involve the police, but after the racist language of the second letter, they filed a report with the Park Station police district and the district Supervisor, Norman Yee. The family lives in one of the city’s more conservative enclaves — 10.8 percent of voters in District 7 identified as Republicans in the 2016 Presidential election. That is the second highest percentage of Republican voters in San Francisco behind only District 2, with 14.5 percent. Instead of being intimidated, Lee and Tamayo-Lee went door-to-door in their neighborhood, passing out Black Lives Matter signs. The sign on their home. Photo by Nikka Singh. The messages. Courtesy of the family. yes, there is white racism against asians… has been for centuries in this country. you don’t need to go to Berkley or any other liberal college to learn that. particularly if you are asian. you need to learn, apparently, the same groups you support, including the liberal parties and BLM… that asians are violently harassed, intimidated and killed in may urban cities and nothing is done by anyone, including the asian leaders of the democratic party. Such as, in philadelphia where asian leaders, are so dug in with the democrats and support black and hispanic causes, they turn their backs on the poor asian communities. don’t take a side unless you know. you are simply looking to join a cause, then work for your people instead of riding the wagon of others.